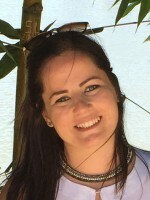 Clara Magalhães master in Biochemistry in 2015 at the University of Aveiro. -Synthesis and characterization of organic ligands, organometallic complexes. -Immobilization of inorganic/organometallic complexes cucurbiturils and layered double hydroxides and respective characterization. 2017, PHYSICAL CHEMISTRY CHEMICAL PHYSICS, 19, 32, 21548-21555. 2016, DALTON TRANSACTIONS, 45, 42, 17042-17052. 2015, supervised by Isabel Maria de Sousa Gonçalves, Martyn Pillinger.